Fable 3 Needs to Earn $150 Million to Prevent "Withering"
According to Peter Molyneux, when it comes to sales numbers, Fable 3 has some big shoes to fill..
Expectations are running high for Fable 3, which hits store shelves this coming October. While gamers are hoping for some great gameplay and a wonderful setting, Peter Molyneux of Lionhead has revealed that there are some lofty sales goals for the title. Speaking to GamesIndustry.biz about what Lionhead and Microsoft expect from the game, Molyneux said that the companies are hoping Fable 3 will sell more than 5 million copies, resulting in a profit "in excess" of $150 million. "We have to do that because if a franchise doesn't reach that level it will inevitably wither," he said. On top of this news, the DLC Lionhead released for Fable II was successful enough for the developer to plan episodic expansions for Fable 3. Not only that, but the first such episode won't cost gamers a penny when it goes live "soon after the retail launch." This first piece of DLC will provide roughly an hour of extra play. 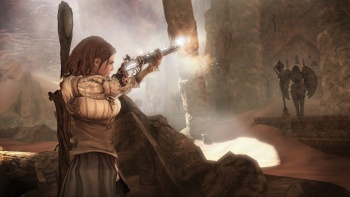 Fable 3 will undoubtedly sell well, but stating that the game needs to earn $150 million sounds a little extreme. Molyneux seems to be missing the point about what causes a franchise to "wither". Gamers tend to lose interest in a series when new titles are no longer interesting or innovative. If Lionhead keeps on providing new content and excellent gameplay, then it doesn't seem like the developer has anything to worry about in the near future.